Welcome to our website. 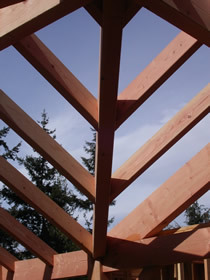 Northwest Timber Frames is a family-owned, full-service timber frame company serving the Pacific Northwest. We pride ourselves on our integrity, quality craftsmanship, and superb service. If you want a beautiful, hand-crafted, energy-efficient, affordable, one-of-a-kind home that will last over 100 years, then choosing to build a Northwest Timber Frames home will be a decision that you and your family will enjoy for generations to come. 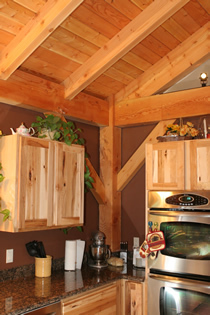 We're a full service timber frame company. With our in-house design services, timber framing and custom home building experience, Northwest Timber Frames can see every element of your project through. We tailor our services to meet YOUR needs. While we collaborate with homeowners and contractors who require only specific services (timber frame elements, trusses, etc. ), we are also capable of transforming your ideas and rough sketches into the finished home of your dreams. Responsiveness. During the course of your project with us, from design to completion, we won't leave you hanging. Whether you have concerns, or just want an update on your project, we pride ourselves on always picking up the phone or promptly returning your call. Value for your Money. Timber frame homes are a luxury not exclusive to those earning substantial incomes. We work within all levels of the budget spectrum to create elegant, unique, fulfilling homes.